Hundreds of lives have been saved by a new ambulance response system which prioritises life-threatening calls, a study has found. The Scottish Ambulance Service changed the way it responds to the most unwell patients in 2016. Incidents such as cardiac arrests are now given the highest priority by call handlers. An evaluation of the changes has concluded the system has saved the equivalent of 1,182 lives. Under the new system, call handlers are taking longer on the phone to despatch paramedics and some lower priority calls are waiting longer for an ambulance, the review concludes. But both the Scottish Ambulance Service (SAS) and researchers at the University of Stirling have concluded the new approach is saving lives. Jim Ward, medical director of the SAS, said: "The previous response model had been in place, virtually unchanged, since 1974, so designing a better model to provide a good response for all patients has been a top priority for us. "We now have an evidence-based approach which identifies patient need and matches our response accordingly. "Our aim is to give every patient the best possible service we can. "For those patients in critical situations, this can be literally lifesaving, whereas for other patients, such as those with chest pain or stroke symptoms, the priority is getting a high-quality clinical assessment before being transferred safely to a specialist unit." The new response model was introduced in 2016 and gave priority to immediately life-threatening calls, such as a cardiac arrest. Other calls are prioritised by clinical need, with no time target, and call handlers spend more time to ascertain if a patient needs to be sent to a specialist facility, such as a stroke unit. SAS data shows that in 2017, the first full year of the new call handling approach, there was a 43% increase in survival for those with immediate life threatening conditions - the equivalent to an additional 1,182 lives saved. In addition to the SAS research, the University of Stirling also assessed 30-day survival rates in patients with Immediate Life Threatening (ILT) conditions since the shake-up. Researchers found that in January 2016 - before the new model was introduced - two in 10 patients with ILT conditions were likely to survive. Under the new model, that increased to four in 10 in January 2017 and three in 10 in January last year. Prof Jayne Donaldson, who led the research and is dean of the faculty of health sciences and sport at the University of Stirling, said: "We found that the new model can accurately identify patients who have the greatest need for ambulance services. "While the identification and triage of patients takes time for the call handler and dispatching system, the new clinical response model can get an ambulance crew to patients who need them most. "Ultimately, this approach has improved the survival of those with immediate life threatening conditions." Researchers also noted the SAS is facing increased demand, with the number of recorded incidents in January last year up by 9% during the same month in 2016. 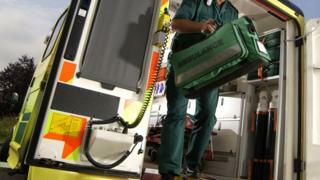 Concerns have been raised about ambulance response rates in some parts of Scotland and GPs have claimed ambulance services are downgrading their calls because they are coming from a doctor's surgery. Andrew Buist, chairman of the British Medical Association's Scottish GPs committee, said: "We continue to have serious concerns around delays to ambulances when GPs have requested one. "Ambulance response times which do not meet what is determined as necessary by the GP, who has made the clinical assessment of the patient, may have a serious adverse impact on patients. "Building on the success of this study, we now absolutely need to see issues with delays when GPs request an ambulance effectively addressed."